LinkedIn has made a priority to improve the newsfeed and various aspects of their UI & site design since their acquisition by Microsoft. Following suit of other social networks, like Facebook and Twitter, LinkedIn now has native video enabled in the newsfeed; at least for some of us (for me it was through the LI Android app). Previously, it was only available for a select few “in-fluencers” and course instructors. I decided to try it out by posting a LinkedIn video, which you can see here on LinkedIn (I can’t yet embed it on here). The video was 1 minute 40 seconds long. I tagged one person in context, and a few others from the ‘Who might be interested in this’ prompt. After posting the video on Sunday Night, the video has received over 200 likes and 10,000 views as of Friday afternoon (5 days later). As per the newsfeed norm, most of the views came from outside my primary network (2nd+ degree connections). The LinkedIn newsfeed algorithm functions so that every like and comment could potentially broadcast the respective post out to that person’s (1st-degree) network. 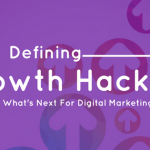 Naturally, those with already established audiences will be in prime position to capitalize. However, some newcomers with compelling content will be able to stand out. There’s a similar case with locality, as my home metropolitan area, Dallas-Fort Worth, isn’t even one of the top 5. Based off of this one video, it seems that Sunday Night in the Americas, and Monday Morning for APAC and EMEA would be the ideal time to post. My rationale is that people tend to browse and check LinkedIn in the mornings. I’ve noticed consistent (albeit waning) increase in engagements each morning for the video throughout this past week. This could work well for weekly series. For daily series, the early mornings of your local time zone (or the time zone where the majority of your connections would be based in) would be the ideal time. This is reflective of optimal posting times for other types of content on LinkedIn. I’ll cover the drawbacks and limitations below. 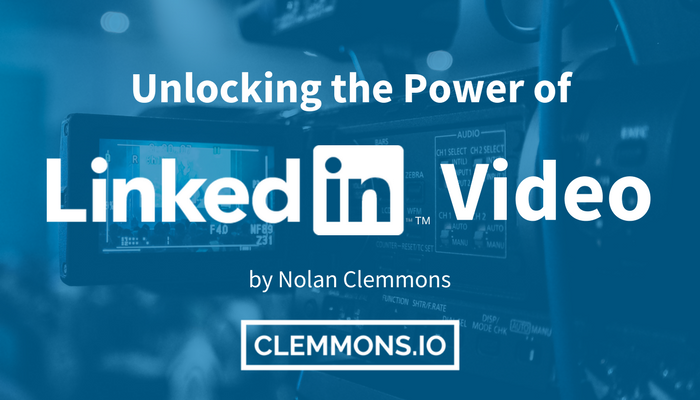 For now, let’s cover the advantages of LinkedIn Video. 1. High Organic (free) reach compared to other platforms.  This is due to the nature of the LinkedIn algorithm and how content reaches those inside, as well as outside, your network. 2. Community of Business Professionals – If your audience / customers are on LinkedIn, then so should your content. LinkedIn users have real names, and are (hopefully) real professionals. 3. Very Powerful for Personal Branding – Viewers can instantly go to your profile and message & connect with you directly. Higher conversions since users can bypass traditional online funnel mechanics (landing pages & forms) seen in B2B marketing. 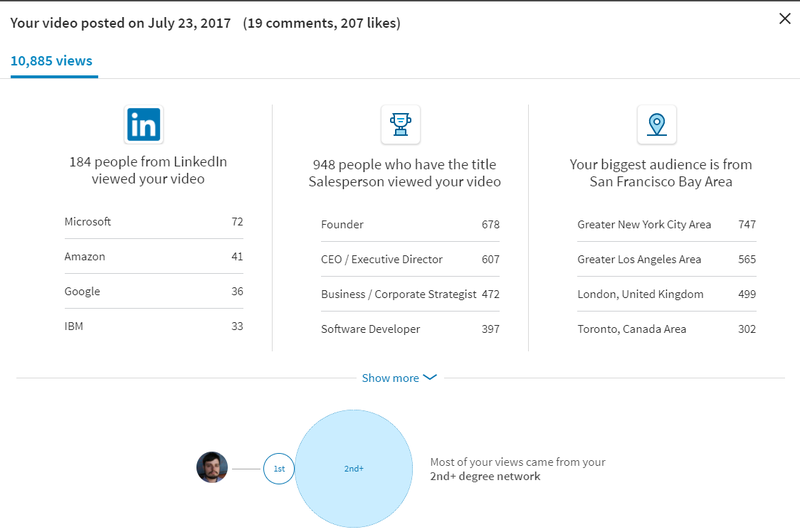 While the ability to determine the job title and employer of viewers can be useful, the analytics provided on LinkedIn videos isn’t robust as it is on Facebook or YouTube. It counts views as those who have watched at least 3 seconds of the video, but gives not data beyond that. Facebook video, on the other hand, provides a graph showing at how far into the video viewers stay on average. You could take advantage of this asymmetrical data availability by recycling your video onto other networks and using the info provided here (the top 10 job titles, metro areas, and employers of viewers) to determine what audience to target (or exclude) through Facebook ads. Conversely, through analyzing insights gathered via Facebook or YouTube, you could determine which videos you should post on to LinkedIn in the first place. Facebook (and now Instagram) has the capability for businesses to create a custom retargeting audience consisting of video viewers (along with the ability to exclude those that stop watching prior to a certain time), but it doesn’t seem that LinkedIn videos have this yet. On the bright side, marketers can now create a remarketing audience from their web traffic (along with their email lists) with the LinkedIn Insight Tag to use for LinkedIn ads. As you saw above, there doesn’t seem to be a way to embed the actual video into articles like this. I’m also unsure about embedding posts made on LinkedIn onto external sites (a few attempts have been made to do so). It would be a great way to drive traffic to your LinkedIn audience, though. Such a feature would also be in line with the recent change to make LinkedIn content public by default. You can now externally embed Linked videos, with or without the text post, on the web. More info is here in my LinkedIn marketing guide. I think short videos talking about a single topic would be the best format. 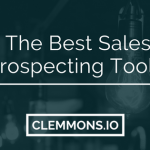 Most of the enterprise content will likely be for marketing or recruiting purposes. These could be either Vlog style videos of people recording straight from their desk, or informational videos. 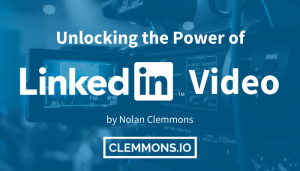 As further indexability and categorization arrives, it will be essential that you develop a library of videos for LinkedIn. Captions may be useful as well, since those in cubicle environments may not be able to hear audio.